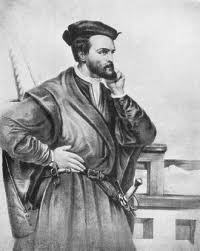 Jacques Cartier (December 31, 1491 – September 1, 1557) was a French explorer of Breton origin who claimed what is now Canada for France. Jacques Cartier was the first European to describe and map the Gulf of Saint Lawrence and the shores of the Saint Lawrence River, which he named “The Country of Canadas”, after the Iroquois names for the two big settlements he saw at Stadacona (Quebec City) and at Hochelaga (Montreal Island). Jacques Cartier made three voyages to Canada. On April 20, 1534, accompanied by approximately 60 sailors who were to handle two ships of about 60 tonnes each, Cartier set sail from Saint-Malo. Crossing the Atlantic went smoothly; after 20 days, he entered the Strait of Belle Isle. After following the north shore of the gulf of St. Lawrence for a time, he turned back, then headed south following the west coast of Newfoundland. Then, sailing toward the continent, he deduced the existence of the Cabot Street, skirted the Magdalen Islands, rounded the northern tip of Prince Edward Island, and put in at Chaleur Bay. Believing he had discovered the passage to Asia, he travelled to the head of the bay, but then had to backtrack. A storm drove him into the bay of Gaspé, where he met more than 300 people from Stadacona (Québec), who had come there to fish. Two Amerindians who were relatives (sons) of the chief Donnacona were made to embark on Cartier’s ship; they accompanied the explorer on the remainder of his exploration. Following this, weather conditions prevented Cartier from making out the entrance to the St. Lawrence River between the Gaspé peninsula and Anticosti Island. After hunting along the north shore of this island, he finally found a passage, but was unable to travel further inland on account of strong winds and opposing tides. As winter was not far off, Cartier and his men decided to head the two ships back to France. A second voyage thus became a compelling necessity: the St. Lawrence River might be the northern passage so ardently hoped for. Upon returning from Hochelaga in mid-October, Cartier and his crew gradually confronted the rigors of the harsh Canadian climate. Intense cold froze the food and drink kept inside the ships, which were used for shelter during the winter season. The French were weakened by a combination of cold weather and poor food, and were unable to resist disease effectively. The 110 members of the crew primarily ate dried or salt meat; fruit and vegetables were absent from their diet. Owing to the lack of vitamin C, scurvy, a disease whose causes were unknown at the time, decimated the crew. By mid-February, nearly all of the sailors suffered from this disease. Their legs and arms became swollen, their gums rotted and their teeth fell out. Finally, and even though Cartier had employed a hundred and one ruses in order to dissimulate the poor health of his crew, the Amerindians supplied the scurvy-sufferers with an unhoped-for remedy. At Cartier’s request, Domagaya had the medicine prepared by two Amerindian women. Annedda, a kind of tea, is made using the bark and twigs of a Canadian conifer believed to be the Eastern white cedar. These ingredients were crushed then boiled to make a brew that the sick were made to drink. The residues of this concoction were applied to parts of their body. During this particularly difficult winter, 25 sailors died from this horrible disease, and the others were saved in extremis thanks to the care provided by Domagaya. Adding to the difficulties in connection with a harsh climate and rampant illness, relations with the Amerindians became acrimonious, which made wintering even more difficult. The palisades erected around the ships during Cartier’s journey to Hochelaga were not enough to calm the worries of the French. No sooner had fall ended than Domagaya and Taignoagny attempted to dissuade their fellow villagers from bartering with the sailors by declaiming against the worthless presents offered to the Amerindians. On November 5, however, a great celebration of reconciliation was held. The captain nevertheless remained distrustful. In February, Chief Donnacona and men from the village set out on a hunting expedition. When they returned two months later, they came accompanied by several people whom Cartier was unable to recognize. Tensions mounted; the French now feared an attack. In early May, the captain took action, and had Donnacona, Domagaya, Taignoagny and several other inhabitants of Stadacona taken hostage. These Amerindians would guarantee safe passage for the French. In addition, they could describe the great marvels of Canada to François I. Cartier set sail for the home country on May 5, 1536. 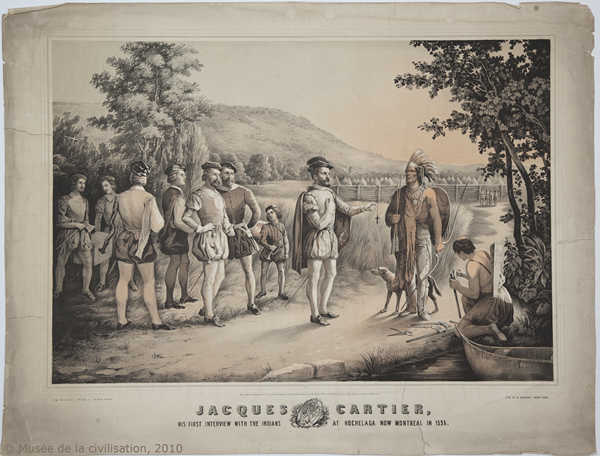 Upon arriving in France, the Amerindians whom Cartier had taken with him were so convincing that in 1541, François I sponsored a vast colonizing expedition, and named Jean-François de la Rocque, Sieur de Roberval, as commander. Cartier arrived at the appointed destination one year before Roberval, and established a settlement at the foot of the cliffs at Cap-Rouge, where he also erected fortifications. After making a second journey to Hochelaga, Cartier learned that the route beyond the Lachine rapids was long and difficult. This bit of bad news, coupled with his discovery of what he believed to be gold and diamonds in the rocks of Cap-Rouge, explain his hurry to return to France. En route, he encountered Roberval in Newfoundland. The commander ordered him to turn back. Cartier, who was anxious to convert his cargo into cash as quickly as possible, nevertheless disobeyed. Roberval, who was now deprived of Cartier’s assistance, spent a horrendous winter at the site of this navigator’s settlement, and had to repatriate the tiny colony to France the following spring. Cartier’s third voyage, which had been intended for exploration and colonization, proved a failure, as did Sieur de Roberval’s attempt at establishing a settlement, moreover. The gold and diamonds that Cartier believed he had discovered were actually nothing more than iron pyrite and quartz! It was only in the early 16th century, following the dispersion of the S. Lawrence Iroquoians. Quebec became the centre of the first French colony in America.